I have a knee brace. The little sucker goes from mid-calf to mid-thigh… and it’s going to have a twin for the other knee. I’m sort of disappointed because I thought it was going to be solely for when I exercise daily. Only that’s not true; it’s going to be for eight hours a day. How did I so misunderstand what the doctor was saying? More importantly, what the heck is this for? I double checked this with the rheumotologist: it’s to postpone knee surgery as long as possible. As I understand it, there’s even a possibility of avoiding the surgery all together. I like that option. It’s also meant to minimize the pain. I like that, too. The culprit here is osteoarthritis, which has worsened with age. Lucky me. All those years of dance, judo, Tai Chi, Aikido, and stage movement have done a job on my knees. That doesn’t mean I stop dancing or exercising, though. It also doesn’t mean I start taking more medications, either. Hey! I have Chronic Kidney Disease. You can read more about osteo and other types of knee arthritis on their site at http://orthoinfo.aaos.org/topic.cfm?topic=a00212. Well, that explains why the knees clicking isn’t a source of amusement anymore and why getting on my knees to play with sweet Ms. Bella is now agony. So now we understand why the knee braces (and the Limbrel). They – the braces – supposedly fit under your clothes. Uh, no, not if you’re a woman who wants to wear anything remotely stylish or not live in longish skirts. 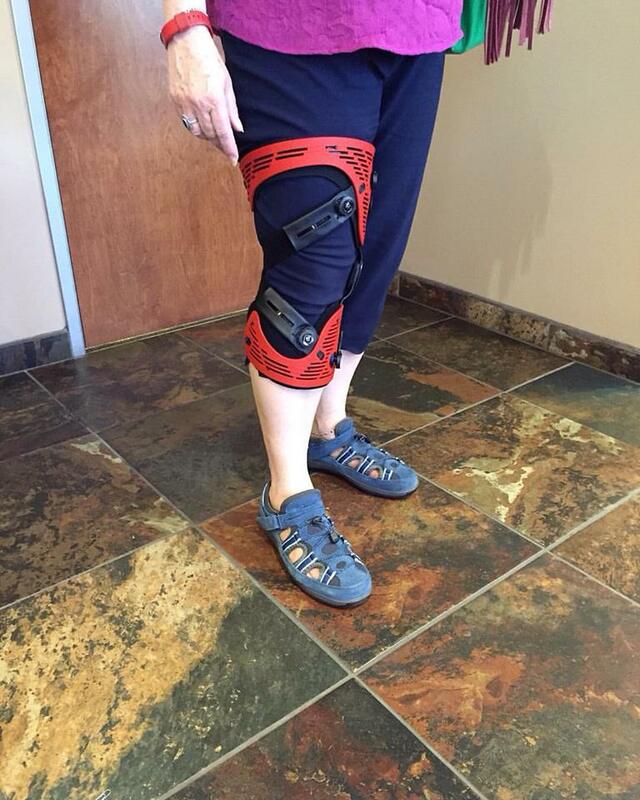 I could not get my capris or slacks on over the brace. Living in Arizona, longish skirts may work in the winter time, but they are too damned hot for the summer… which lasts from early May to late October. So, how do these babies work you ask. I went over to the manufacturer’s website for the answer to that one. “The Unloader One applies a gentle force design to reduce the pressure on the affected part of the knee, resulting in reduction in pain and thus allowing the patient to use the knee normally and more frequently. I wanted to know a bit more about how the knee works. 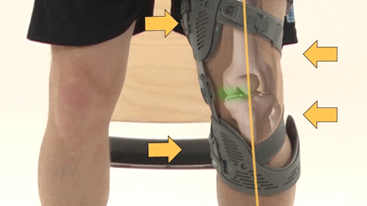 The National Institute of Health at http://www.niams.nih.gov/Health_Info/Knee_Problems/default.asp explained in detail. 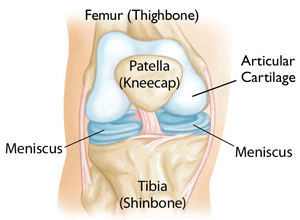 The knee joint is the junction of three bones: the femur (thigh bone or upper leg bone), the tibia (shin bone or larger bone of the lower leg), and the patella (kneecap). …The ends of the three bones in the knee joint are covered with articular cartilage, a tough, elastic material that helps absorb shock and allows the knee joint to move smoothly. Separating the bones of the knee are pads of connective tissue called menisci (men-NISS-sky). …The two menisci in each knee act as shock absorbers, cushioning the lower part of the leg from the weight of the rest of the body as well as enhancing stability. There are two groups of muscles at the knee. The four quadriceps muscles on the front of the thigh work to straighten the knee from a bent position. The hamstring muscles, which run along the back of the thigh from the hip to just below the knee, help to bend the knee. The medial collateral ligament, which runs along the inside of the knee joint, provides stability to the inner (medial) part of the knee. 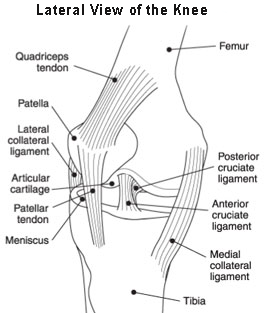 The lateral collateral ligament, which runs along the outside of the knee joint, provides stability to the outer (lateral) part of the knee. The anterior cruciate ligament, in the center of the knee, limits rotation and the forward movement of the tibia. The posterior cruciate ligament, also in the center of the knee, limits backward movement of the tibia. CKD brings a new way of thinking about every part of your body… even your knees. Think about it. I’ve gotten more questions this week about more different areas of health when you have Chronic Kidney Disease than I’ve gotten in a long time. Before we start on the one that will be answered today, I have a question for you. 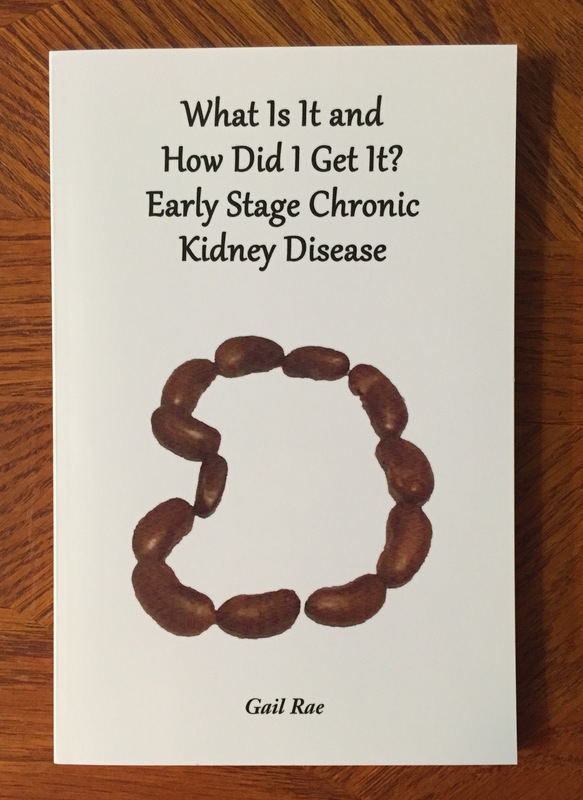 Will you please post a review of The Book of Blogs: Moderate Stage Chronic Kidney Disease, Part 1 or Part 2 (or both) on Amazon? My sales reports tell me they’re being sold, but I don’t see any reviews. 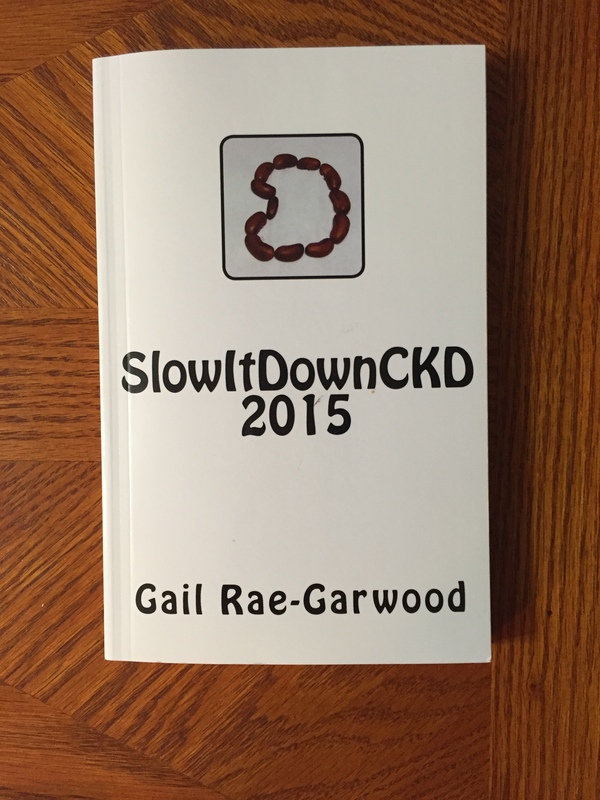 If we’re going to keep spreading awareness of CKD, we’re going to need these reviews. A number of people – including my primary care physician – were shocked by the large bruise caused by last week’s partially successful venipuncture. She, of course, knew what happened after I told her how I got it, but many of my readers didn’t. I’m not so sure I did, either. Nor did I know why it was taking so long to heal. 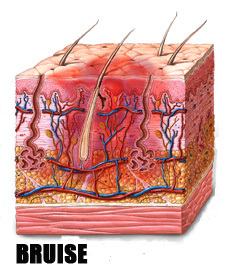 Bruising is caused by bleeding under the skin. For example, a hard knock that does not break the skin can damage fragile blood vessels that lie just beneath. These damaged blood vessels leak a small amount of blood, which collects in the area as a bruise. With time, the familiar blue-black discoloration changes to yellow and can move up and down the arm but eventually fades and disappears. I’m beginning to wonder just how much time. Although, there was evidently a lot of under the skin bleeding happening here. One cause of pain is a hematoma. A hematoma is a collection of blood that forms outside the vein. During a blood draw when the needle pierces the vein, it can become temporarily damaged causing blood to leak out into the tissue. The leaked blood forms a pocket of blood, which can be painful. It’s not uncommon for the area around a hematoma to turn red or blue, and the surrounding tissue to become swollen. Fortunately, the body gradually reabsorbs the displaced blood cells, and the hematoma slowly resolves – although it can look pretty ugly in the meantime. A hematoma is quite easy to see and is a very visible cause of pain in the arm days after a blood test. 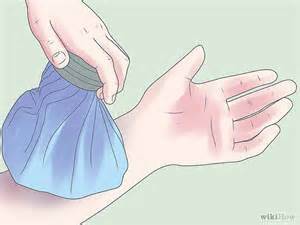 Doctors usually recommend that people treat hematomas by applying ice packs, elevating the arm, and taking anti-inflammatory medications for the pain. Hematomas usually resolve in five to seven days. Acetaminophen (This is me here. Acetaminophen is not a NSAID and may be taken by CKD patients.) may be taken for pain as instructed on the bottle. 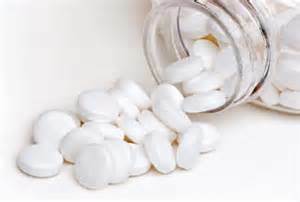 Avoid aspirin or ibuprofen because they slow the blood from clotting and may, in fact, prolong the bleeding. Funny, Bear took a look at my arm just this morning and suggested the heat, too. I guess the man knows what he’s talking about. Located deeper in the body to protect against haemorrhage. Muscular, to withstand heavy pumping and therefore more difficult to puncture. Supplied with abundant nerve fibres; therefore, arterial puncture tends to be more painful. At risk of extended bleeding after puncture because blood flowing through is under great pressure. 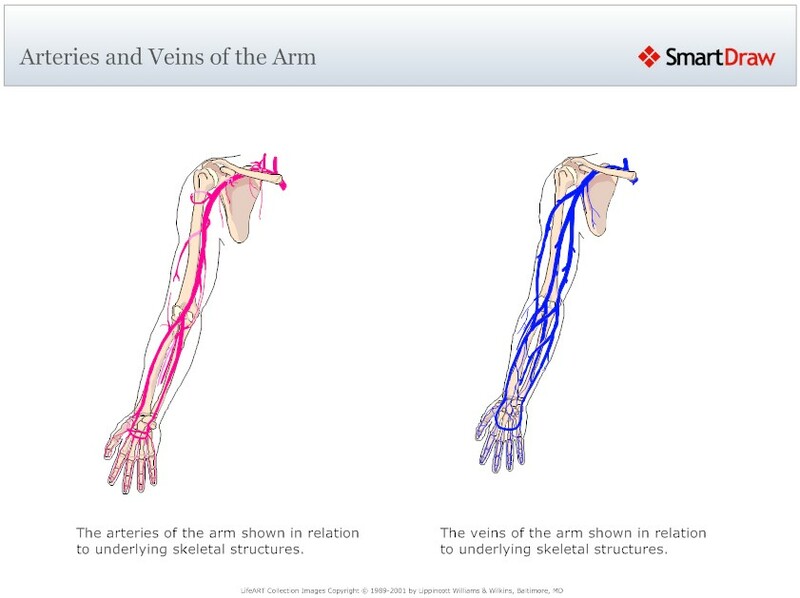 Supplied with fewer nerve fibres than arteries; therefore venipuncture is less painful. I hope this helped. It certainly helped me understand what happened. I am missing the excitement of a contest. Since the name of my game is CKD awareness, I propose you send me a comment naming your favorite CKD book and why it’s your favorite. You can keep it to a paragraph or two. Notice, I did not write which one of MY CKD books is your favorite. You’ll be introducing us to books we may not be aware of and I will gladly compile the entries into a reading list for all of us. Digital will be included. Let’s run this baby for a week. The prize? Why a print copy of The Book of Blogs: Part 1, of course. Don’t forget about free Path to Wellness health screening coming up. 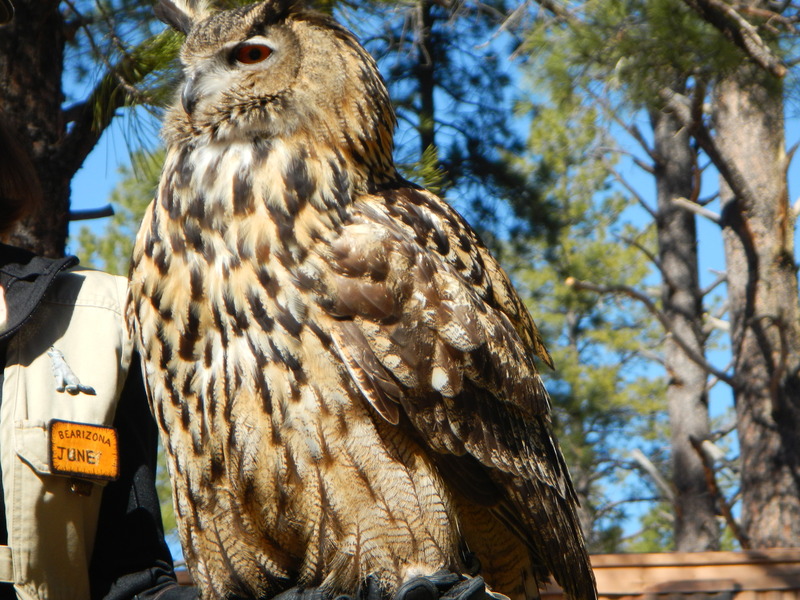 This one is in Mesa, Arizona, at Adelante Healthcare 1705 W. Main St. on the 20th from 8 to 1:30 on Saturday, June 20th. Never what? One of the first rules we learn as Chronic Kidney Disease patients is never to take a NSAID, a non-steroidal anti-inflammatory drug. Raise your hand if you remember why. Hello fellow with the beard in the back of the room; what do you say? Correct! They further damage the kidneys. Can you tell us how? No? Don’t feel bad. Most people can’t, even those suffering from CKD. Yes, young lady in the third row. This is a bit more detailed a list than you’d expected? Okay, let’s go back to What Is It And How Did I Get It? Early Stage Chronic Kidney Disease for a simple explanation of NSAID. Please turn to page 134. Those of you with digital copies of the book, search the phrase. Everyone have it? NSAID: Non-steroidal anti-inflammatory drugs such as ibuprofen, aspirin, Aleve or naproxen usually used for arthritis or pain management, can worsen kidney disease, sometimes irreversibly. So now we’re back to the original question. 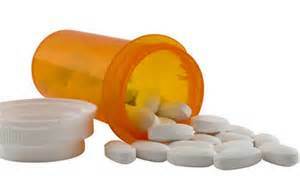 How do NSAIDS further damage our kidneys? But first I want to tell you just how important it is not to take them by sharing an anecdote with you. The first year after my CKD diagnose, my nephrologist spent a great deal of his time trying to convince me that I had caused by own CKD by taking NSAIDS very, very often. He might have been right with another patient, but I was never one to rely on medications. Yet, overuse of NSAIDS was so common a cause of CKD that this was the only cause my nephrologist could see. A while after this, studies showed that aging kidneys will lose their filtering power at the rate of ½% per year. He switched to this cause, which I could more readily accept. Yes, yes, I know we were going to discuss how NSAIDS further damage the kidneys today. By the way, as early as 1984, the National Institutes of Health at http://www.ncbi.nlm.nih.gov/pmc/articles/PMC1483278/?page=2 published a journal article from the Canadian Medical Association Journal entitled Adverse effects of NSAIDs on renal function. Why no, I’m not procrastinating at all. Here’s the answer to today’s question. All NSAIDs work by blocking the action of cyclooxygenase (COX). This enzyme performs a key step in the synthesis of prostaglandins [ me here with a definition of this word from the freedictionary.com at http://medical-dictionary.thefreedictionary.com/Prostaglandins – a group of potent hormonelike substances that produce a wide range of body responses such as changing capillary permeability, smooth muscle tone, clumping of platelets, and endocrine and exocrine functions. They are involved in the pain process of inflammation. ], which produce many effects in the body. Two of the effects are pain and inflammation for injured tissue. Other effects include protection of the stomach and homeostasis (regulation) of kidney function. The COX enzyme comes in two forms, COX-1 and COX-2. For a while, it was thought that COX-2 produces the pain and inflammation prostaglandins, while COX-1 produces the protective and regulatory prostaglandins. The underlining is mine. That’s right, NSAIDS interfere with the regulation of the kidney function. How? Another good question from the middle of the room. 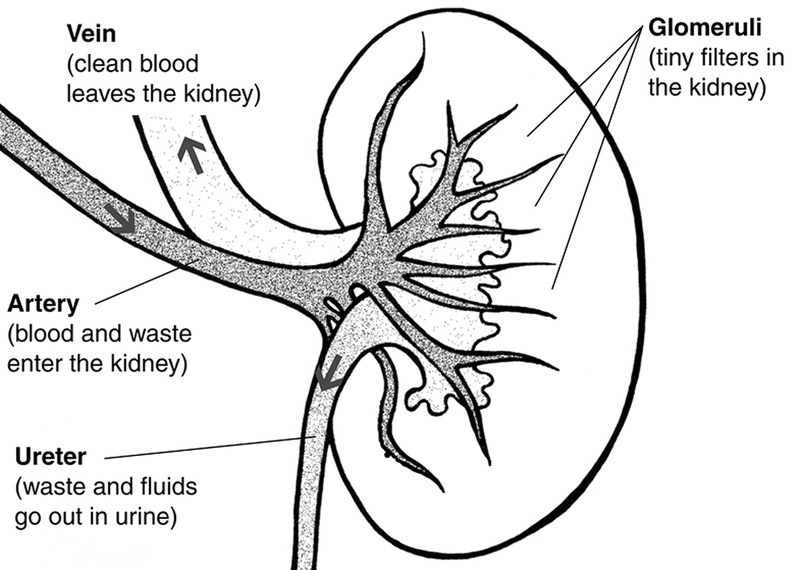 So now we need to know why blood flow to the kidneys is important for CKD patients. If you look at a picture of your kidney, you’ll see that blood with wastes in it is brought to the kidneys by the renal artery and clean blood is exited from the kidneys by the renal vein. Your kidneys are already compromised which means they are not doing such a great job of filtering your blood. Reduce the blood flow and you’re exacerbating the problem you already have… and all you need to do is avoid NSAIDS to avoid this problem. You’re right, class, that’s not exactly true, but it will help you preserve more of your kidney function. Any questions for me? For each other? Well then, thank you for being such a willing and involved group of students. While we all know this isn’t really a classroom and I’m not a doctor, this should answer a great many of the questions I’ve received via email or comments. I’m also looking for first source research on both chia seeds and Goji Berries for a reader. It seems there’s quite a bit of conflicting information about the safety of these two for CKD patients. Please send along what you have, but first source only (not opinion, but fact). It’s been my pleasure, folks. She Can Really DISH It Out! Whoopee! Sales for the book are rising! Thank you so much! I’m eager to donate even more books to those who need them but can’t afford them now. And more good news: SlowItDown will be presenting at The Men’s And Women’s Gathering of The Salt River Pima – Maricopa Indian Community at Talking Stick Resort in Scottsdale, Arizona, this Thursday. We’ll be there during the third breakout session from 3:15 to 5 in Quail Room E. We’d love to see you there (hint, hint). I write about all these ailments I have, but I need to re-focus you here. They’re all small or just beginning for me so I’m not in any dire straits. Even the Chronic Kidney Disease is holding steady at Stage 3. I didn’t want you to think I was falling apart at the seams…which is kind of an opposite analogy for how I am very slowly falling apart internally, anyway. So, as usual, I looked it up. Biology online at http://www.biology-online.org/dictionary/Dorsal_spine told me it is, “One of the three distinct portions along the spine or the vertebral column (the other two are the cervical spine and the lumbar spine), and is the longest section comprised of twelve thoracic vertebrae that house the spinal cord along the rachidian channel. “Great. I was lost. What did I know about rachidian channels? And where on the spine was it? I found discussions of rachidian channels on the internet, but I couldn’t follow them. Maybe it would help to further break down the definition. At http://dictionary.reference.com/browse/dorsal, I found that, among other definitions, dorsal means “situated on or toward the upper side of the body, equivalent to the back, or posterior, in humans. “ Wait a minute, so there was something on the lower back of my spine. Got it. I should have figured. There were bone spurs on the back of my lower spine. Ugh! Another indication of my advanced (Can I get away with writing advancing instead?) age. 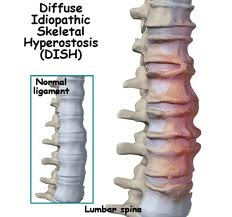 “Diffuse idiopathic skeletal hyperostosis (DISH) is calcification or a bony hardening of ligaments in areas where they attach to your spine. Also known as Forestier’s disease, diffuse idiopathic skeletal hyperostosis may cause no symptoms and require no treatment. The most common symptoms are mild to moderate pain and stiffness in your upper back. DISH may also affect your neck and lower back. Some people experience DISH in other areas, such as shoulders, elbows, knees and heels. Oh, my G-d! I’m ossifying!!!! To be honest, I’m just not worried. There’s a little wrong here and a little wrong there in my body… and probably yours too as you, no other way to say it, age. “A form of degenerative arthritis characteristically associated with flowing calcification along the sides of the vertebrae of the spine and commonly with inflammation (tendinitis) and calcification of the tendons at their attachments points to bone. Makes sense. I have arthritis (in my case, degenerative inflammation of the joints) everywhere else in my body, why not my spine too? But the jokes on me. Notice that NSAIDS can be helpful. Yep, Chronic Kidney Disease sufferers cannot take NSAIDS. I’m lucky that I had a high pain tolerance before the CKD and, it seems to me, that it’s been rising ever since my diagnose five years ago. If you can’t take anything for the pain, you learn to live with as much pain as you can. I’m uncomfortable sometimes, I can no longer exercise the way I want to for as long as and hard as I want to, but I can dance! I’m thankful because that’s what makes me happy anyway. 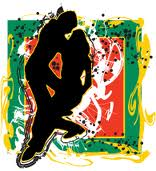 Now, if I could only find a way to dance 24/7…. Are you watching out for your health? It’s been pretty busy over here with Bear’s retirement, the impending death of a loved one, Nima’s visit to say goodbye to Cheryl, and life in general. That might explain why I just plain forgot about watching out for mine – specifically, the pain in my shoulder. Bear is officially retired, Nima’s gone home, there’s nothing more to do for Cheryl and it’s life as usual so the pain is back. It hurts, but just a little. NSAIDS are out of the question, or are they? I forgot to mention my computer is fried (Do you think I use it too much? ), so I pulled out my trusty laptop to write this blog… and found some interesting – if older – articles I’d saved. The first one to hit my eye (figuratively, literally would have prompted a whole new discussion of pain killers!) was about the NSAID controversy. NSAID means Non-Steroidal Anti-Inflammatory Drug. Steroids have an adverse effect on the kidneys in that they strain the kidneys during filtration. One of these articles discusses weighing the risk against the benefits of taking NSAIDS. I also have osteoarthritis, but prefer to take Limbrel – a food medication (by prescription only) to deal with the pain preventatively. I am afraid of damaging my kidneys further and am not willing to take NSAIDS. I went off the Limbrel for a while since it’s so expensive, but noticed the pain in my elbows right away. That’s when I decided the cost of the Limbrel was worth it if it meant no NSAIDS. That was my personal version of weighing the risks against the benefits. You can read this article at http://www.reuters.com/article/2011/09/13/us-kidney-disease-idUSTRE78C6D820110913. Reading MedScape’s coverage of the same study made me realize that 96% of the mild CKD patients in the study were unaware of their diagnose. This article at http://www.medscape.com/viewarticle/749705?src=nl_topic also mentions that at the 2011 date of publication far more patients were aware of their diagnose than during the actual study which took place between 1999 and 2004. I think it’s this careful communication between nephrologist and patient that allows us, as the patients, to make informed decisions for ourselves. I would like to see more of this, though. I’m still waiting for my own nephrologist to call me back about the steroidal drugs I was given during my cataract surgery although I clearly explained to the ophthalmologist that I have CKD and wanted nothing that would harm the kidneys. I’m beginning to wonder if doctors other than nephrologists know what drugs are harmful to the kidneys. But, then again, I’m also wondering why my specialist can’t either return a phone call or ask his MA to do so. Am I nervous about this? You bet. I am actually looking forward to seeing my primary care doctor (that’s right: primary care) for my quarterly blood test since she also orders a GFR reading. According to the US National Library of Medicine (www.ncbi.nim.nih.gov.pubmed/22859857), Bardoxolone Methyl does accomplish what the manufacturer says it does: ” increases estimated GFR, and decreases BUN, serum phosphorus and uric acid concentrations in patients with moderate to severe CKD. 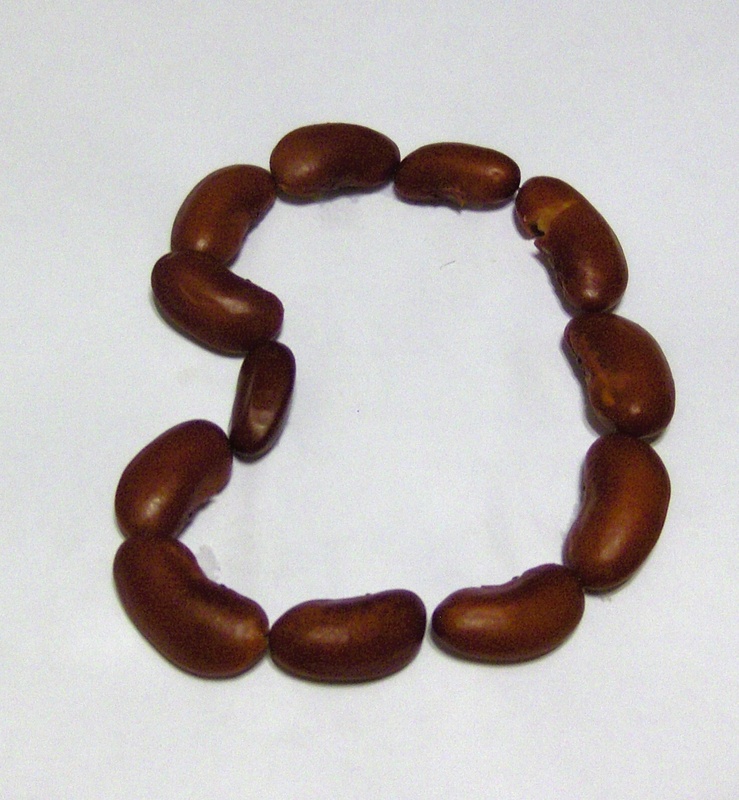 ” However, it also raises albuminuria – not good for CKD patients. No mention of diabetes was noted here. As for side effects, The New England Journal Of Medicine mentions not only the muscle spasms, but the more common gastro-intestional adverse reactions. (www.nejm.org/doi/full/10.1056/NEJMoa1105351#t=articleResults). Right now, the internet is awash with information about this new drug. I am neither pro nor con, so I’d recommend you research it. This could be very exciting! I just realized the book is on sale not only in Europe as well as the United States, but also in India where the blog has 1,300,000 readers. 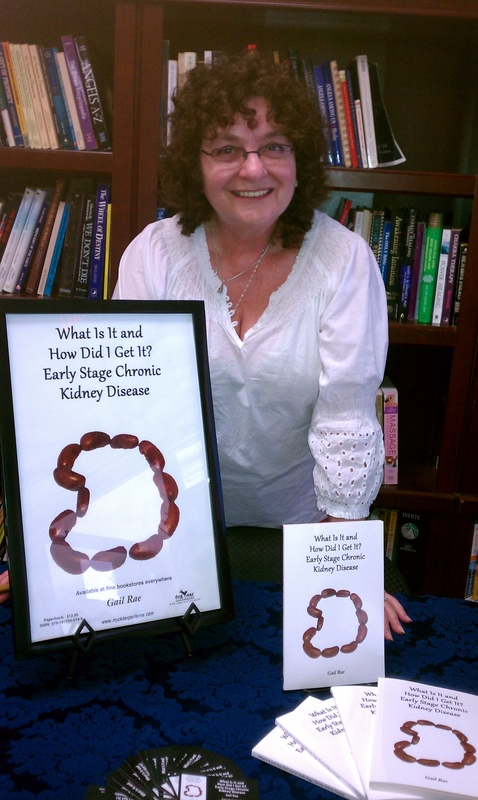 The word about CKD is getting out there. I feel so gratified. Be sure to tell those who need it where they can get the book or read the blog. 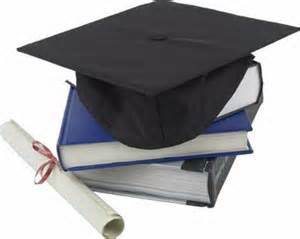 Remember that if they cannot afford the book and want to read it they need only send me the name and address of their nephrologist. Then I’ll visit my pretty little local post office (well, it’s really the setting of the building that’s so pretty) and mail a copy out to the doctor. For those of you not feeling the effects of the economy, look for the book in print and/or digital at Amazon.com or BarnesandNoble.com. You know, you can always leave a message for me at 623-266-2609 to order a book or ask questions. I’m laughing now because I realize I haven’t been this available since I was a single working mom with little kids.